Just short of 50 years ago, a curly-headed Moorhead State College basketball player marshalled his nerve and auditioned alone, just him and his guitar, at a run-down bar north of the tracks in downtown Moorhead. “I’d been playing around at team parties, and one of the guys kept telling me, ‛Johnny, you gotta start getting this out there,’” the outgoing, still-hyperactive audience pleaser recalls. “So I did. I went down to the Rolling Keg [now Mick’s Office] and tried out for the boss. Thus began the Upper Midwest’s longest love affair with a proudly home-grown musician and his boys. As Johnny Holm approaches his golden anniverary onstage, his avid romance with fans – a passion as lusty today as in the bars and ballrooms of yore – burns as bright as ever. If there were an entry in the Guinness Book of Records for the musician who’s traveled farthest and played the most in the Dakotas, Minnesota, Wisconsin and Iowa, it would have Johnny’s name in the headline. 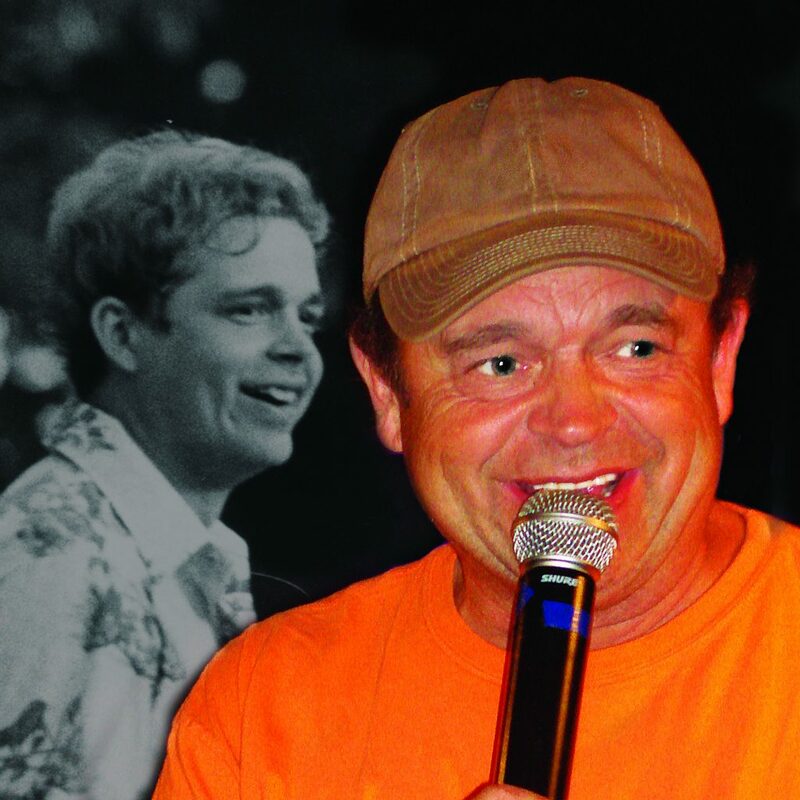 He and his band know every county fair in the five-state region … plus Legion and KC halls, lake country pavilions, homecoming dances, corporate whoop-de-doos and whereever there’s power to plug into and a crowd looking for a good time. Just last week, they played for the North Dakota Grain Dealers in Fargo. That sixth sense may be why he originally branded his group “Johnny Holm’s Traveling Fun Show.” Fans who are grandparents today still remember the manic tempo of their shows, one song seamlessly seguing into the next without taking a breath. From his first days in the hot bars of the day in Fargo-Moorhead and Breckenridge – the Gaslight, the Blazer – the energy has resonated as much as the music, a blend of rock and country hits. Fans not only leapt to their feet: They stood on the tables and chairs and sang along. He remembers being called into owner Don Wold’s office at the Moorhead Holiday Inn. “We’d been playing there for a couple months, and I was worried: ‛Oh, boy. The boss is going to fire us,’’’ he remembers. During the heyday of small-town dance pavilions, the Johnny Holm crew played them all – the Maple Lake Pavilion at Mentor, LRC in Halstad, Herb Johnson’s Barn near Arthur. As the ballrooms faded in the 1990s, they carried on in the venues where young people of those days gathered. “If they have a good time, they keep bringing you back,” he observes. That’s led to amazing longevity at some annual occasions, including playing for his 25th consecutive Concordia homecoming this fall and his 32nd Northfield, Minn., high school prom. “That’s kind of challenging when you’re 68,” he notes. He credits much of his success to the man he calls “my manager, agent and best friend,” Dave Hoffman, better known to dance crowds as Winston Fink of the Unbelievable Uglies. Hoffman, who died in 2007, changed Johnny’s course one day early on. “I was playing at the Blazer in Breckenridge with Lee Massey one night when I got a call from the one and only Winston Fink,” he recounts. “He asked me, ‛What are you making down there?’ It was $500 or something like that. ‛How about if I get you up to $800 and take 3 percent,’ he asked me. Of course! He spent his first nine years in Fargo-Moorhead. “I loved the Red River Valley. When I was a kid, I always wanted to be here,” he says. That’s why he chose Moorhead State College, where he studied special education for five years – never quite completing that degree – and then stuck around until the Valleyfair contract drew him to the Twin Cities. Now an empty-nester after raising five daughters, he lives in Breezy Point near Brainerd, where he grew up. His wife Pam – a special ed teacher whom he met 40 years ago while performing at a convention — passed away one year ago. Over the years, some 70 musicians have played with him. That total, though, includes veterans who have been with him for literally decades. His youngest daughter Jordan is one of the them, with more than 10 years’ tenure under her proud but demanding dad’s tutelage. The years have left their mark. Johnny has been sidelined twice with hip fractures. He was back on stage nine days after the joint replacement, sporting a cane and a big smile. The second, though, caused a three-month hiatus after he re-broke the repaired joint. His hearing is far less than perfect. He’s spending a bit less time on the road, down from the 220 dates a year of the ’80s and ’90s to a mere 160 or so today, including 53 last summer. Even the exuberant Elton John curls are a memory under his ever present baseball cap … but the vibrant good nature and open heart are right where they’ve always been.